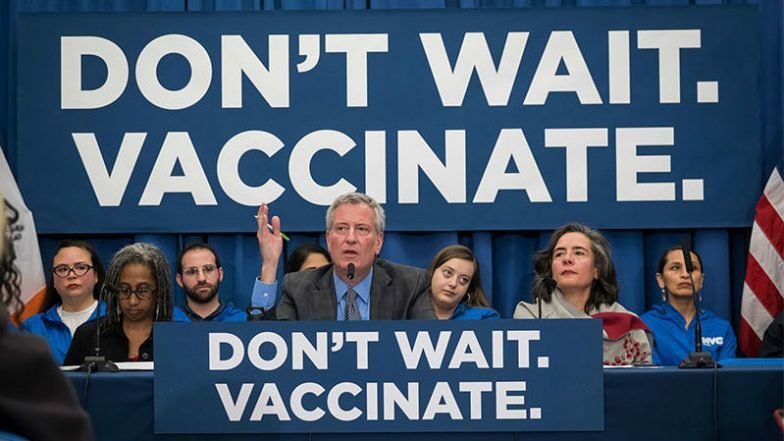 New York, April 17: After an outbreak of measles in parts of the city attributed to many people in those areas who refused to get vaccinated believing in unscientific rumours, New York City has declared a health emergency. Under the emergency order, people living in the affected areas will have to get vaccinated or face fines of $1,000. As of Monday, the city has reported 329 cases of measles, according to City Health Commissioner Oxiris Barbot, who oversees health issues in the city of 8.26 million people. "We expect these numbers to continue, given the incubation period", she warned. Thousands Block London Roads Demanding Urgent Action Over Escalating Ecological Crisis. The city shut down a pre-school programme on Monday because it did not comply with orders that schools cannot allow unvaccinated children to attend classes. Barbot said: "This outbreak is being fuelled by a small group of anti-vaxxers in these neighbourhoods. They have been spreading dangerous misinformation based on fake science." Declaring, "Children are in danger", Mayor Bill DeBlasio ordered the emergency last week. The US politicians and media take a condescending attitude towards developing countries and their health situation, but now the nation's media capital is threatened by an epidemic because of basic ignorance of science, and the people involved are not third world immigrants either. He asked: "Did you know that the government of New York proclaimed an emergency situation regarding a measles epidemic that broke out in the vicinity of the UN Headquarters - in Brooklyn?" Many of those who oppose vaccinations claim that the Measles-Mumps-Rubella (MMR) and other vaccines cause autism or other diseases. Climate Change Protests: More Than 100 People Arrested in London. Trashing the unscientific rumours, Barbot said: "As a pediatrician, I know the MMR vaccine is safe and effective." The city took the unusual step of singling out a religious minority, the ultra-orthodox Jews, for the outbreak and designating the areas where they are concentrated for compulsory vaccination. "Most of these cases have involved members of the Orthodox Jewish community," the Health Department said. The pre-school programme that was shut down was at a yeshiva or religious school that was run by the ultra-orthodox Jewish community. Although the city has singled out the ultra-orthodox Jewish community known as Hasidim, they are outnumbered all over the US by non-Jews in the anti-vaccination movement. When Rockland County, which is across the Hudson River from the city, ordered a state of emergency and banished unvaccinated minors from all public places last month, parents of children at a Christian institution, Green Meadow Waldorf School, were at the forefront of the protest. Public Health Emergency Declared in Brooklyn Amidst Measles Outbreak. They filed a case against the order in a federal court but a judge rejected their suit. An article in the medical publication Cureus said that the conspiracy theories and unscientific views took flight on the digital media and spread rapidly.